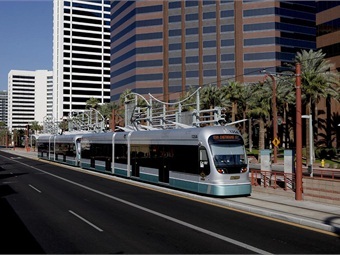 PHOENIX — A five-mile light rail extension in South Phoenix will be the first to get a major boost from the area’s Transportation 2050 program, which will push the opening of the line by more than a decade to 2023, the Arizona Republic reports. The $31.5 billion transportation plan passed by Phoenix voters last summer, raised sales taxes to fund bus, street and light-rail improvements through 2050. The Phoenix City Council recently approved a schedule that would push forward the opening of the south Phoenix line, with the changes expected to be adopted into the regional transit plan this summer. For the full story, click here.